A multi-pronged Birds Eye campaign in partnership with Nickelodeon’s “iCarly” live-action series has yielded strong engagement metrics and sales gains for the brand that helped lift the frozen foods category as a whole during the promotional period, reports Brandi Unchester, senior brand manager, Birds Eye Steamfresh Vegetables. 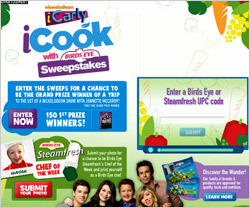 The “iCarly iCook with Birds Eye” campaign, which ran between July 9 and Sept. 9, was part of Birds Eye’s commitment to the Partnership for a Healthier America (the nonprofit dedicated to ending America’s childhood obesity crisis). The brand promised to invest at least $6 million over three calendar years on increasing kids’ vegetable consumption by engaging them through kid-friendly marketing; using kids’ input to create new vegetable products; and making its products more affordable for parents through a massive coupon program. *A sweepstakes offering a grand prize of a trip to Los Angeles to visit the set of the “iCarly” show. The show’s star, Jennette McCurdy, is a Birds Eye brand ambassador. *A Birds Eye iDish game/contest, where kids could play a game that generated “whacky” recipe ideas featuring Steamfresh products. *Birds Eye Steamfresh Chef of the Week, in which kids submitted cooking-related photos of themselves that were featured on the site. *Birds Eye ads on the “iCarly” show and Nickelodeon’s site, and in print media. Sweeps entrants could, at their own option, also elect to submit a recipe (and recipe-submitters could elect to also enter the sweeps). All recipes submitted had a chance of possibly being chosen as the one to be featured in an episode of the “iCarly” show. One of the kid-generated recipes, “Yakimaniac Veggie Martians,” was featured in “iCarly”’s Nov. 10 episode. Birds Eye also promoted the various elements of the campaign -- which was produced internally by Nickelodeon and Weber Shandwick, Chicago -- through its own social media assets throughout the summer, says Unchester. In addition, sweeps-promotion shelf-talkers with entry-form tear-pads (and in some cases other promotional displays) were in food stores throughout the country. According to Unchester, the campaign generated 40,000-plus sweeps entries, 16,000-plus recipe ideas and 255,000 page views on the Nick/Birds Eye site. In addition, 23,000 UPC codes were collected -- and based on syndicated data, Birds Eye products contributed more than one-third of category growth during the promotional period -- countering the frozen food category’s generally flat-to-negative sales trends of recent years. The campaign cost an estimated $3 million, per a July New York Times report. Looking ahead, Unchester reports that Birds Eye has new products geared specifically to kids in development, and plans to launch these in time for the back-to-school season next year. These products will reflect key insights gleaned from the kid-generated recipe ideas, including kids’ preferences for mixing various colorful vegetables and other ingredients, and their preference for bite-sized pieces, says Unchester.